I was talking to a friend awhile back about what kind of car he was going to buy. He told me about every aspect of the car – its engine, the consumer reviews, its’ repair history, the color, the interior, and on and on and on. It was actually impressively exhausting how much research he had done on this car. And good for him, it’s a big decision … right? Now the funny part. That same friend called me yesterday to tell me he’d met a woman – his new girlfriend. Do you see where I am going with this? 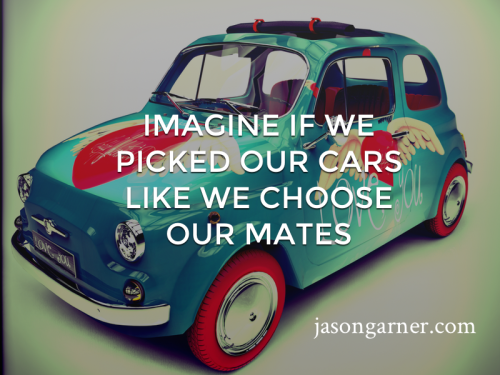 Can you imagine if we chose cars the way we choose our mates? Silly? Kind of … but it’s also the way most of us (myself included) have picked our significant others for years ― on a whim, based on what’s available within a few feet of us, at a given moment … and often at social gatherings that include alcohol. So, to repeat the question ― Can you imagine if we picked a car this way? No way, right? So why do we do this? What is it about romantic love that causes us to act so … impulsively? I think the answer is our fear of being alone. The fear we have of aging by ourselves with no one to love us, waking up each and every day by ourselves in a big king bed and having to face ourselves in the mirror … unloved. The fear of being alone is a very real thing. It is ingrained in our DNA from the time, long ago, when being separated from the tribe meant certain death. We carry that forward today. The very real genetic need to be part of something greater than ourselves. We long to be loved. The little child in us, never truly loved for being himself, is desperately seeking a playmate … someone to share his life with. And so, at 2 a.m. in a bar somewhere, we choose anyone who will have us and we head off to live happily ever after. Then we wake up ― sometimes the next day, sometimes a month later, and sometimes after a wedding, a honeymoon, and a few years of marriage – and we look in the bed next to us and say, “What in the hell did I do?” And then we hop in our car, which we love because we actually did the research on it and bought exactly what we like, and we drive away to pick a new mate, only this time we change it up and go to a different bar … because that old place, after all, is bad luck. So what’s the answer? How do we break this pattern? For me it started by taking an inventory of my life. This was tough because the more I looked at my life the more I realized that the people I was meeting, these people I didn’t really want to be with, where actually a reflection of my lifestyle. We kind of know what sort of people we find at 2 a.m. in the bar, right? And if we’re one of them that says much about who we are at that moment in our lives. I frequently talk about green juices (green vegetables and fruit extracted into a juice) and that’s because drinking green juice was the beginning of my journey to health. From that first green juice I began a transformation that started with my health and body and soon spread to the rest of my life. Think about it, that such a simple change took me to a new bar at a new time ― the juice bar at 9 a.m. And what kind of people are there? See what I mean? Slowly step-by-step my life changed. First green juice, then yoga, then meditation, then herbs, and before long I found myself at a dinner with David Wolfe, Ron Teeguarden, Michael Beckwith, and my future wife Dr. Christy ― a beautiful-convertible-Jaguar of a woman with whom I am madly in love. So now, take a deep breath and imagine your dream life partner ― start from the inside out. What is their heart like? How do you feel when you’re with them? When you stare in their eyes what do you see? Feel the safety of their embrace. See the warmth of their smile. Experience the lifetime of butterflies they make you feel in your stomach. Then close your eyes and just breathe with that image and feeling for a minute or two. Long, deep breaths ― really allowing the experience of your dream partner to come into your space. That dream is who you are. You are that miracle you have been waiting for. And the more you live into your own dream the more you will find it in others. You will put yourself in the right places. You will smile at the right people. You will engage in activities that make your dream come true. For me it all started with a green juice. Where does it begin for you? I love this, but you pretty much ignored the – ahem – elephant in the room. It’s not just alcohol that spurs the impulse. I’d paraphrase your piece in this way: Imagine if we bought a car based solely on how it looked, with no thought of how it ran, while passing up a beat-up used car that ran like a dream? Yes, this is a touchy subject for me. I’m an attractive, though fuller-figured (5’5″, I wear a 14-16 on a strong yoga body) woman who has spent her entire life (I’m 55) being overlooked, or quickly rejected, by men who can’t handle my double-digit size. I like to think the fact that I am blessed with an abundance of rich friendships is a testimony to my personality and ease with intimacy. I’m also a deeply passionate woman with a curious mind. Still, it wasn’t that long ago that a well-meaning female friend told me: Men don’t date overweight women. I wanted to insist that she was wrong, but it has been my experience. In fact, my last date occurred over 7 years ago. Now, I know that this isn’t always true, but I do think it’s usually the case. So many times I read wonderful pieces like this, written from a man’s perspective, only to discover that the author’s partner is a gorgeous, slender woman. I can’t help but wonder – would he be with her if she was, say, 25 lbs. overweight, or would she have been rejected in favor of a car with a more attractive body? I will follow suit! I actually just started do green juices….they end up more red or brown….but they have spinach, kale, broccoli, etc. I’ve been wanting to do them just to put better things into my body. Oddly, the next thing that I’m going to do after my vacation is look for a hot yoga class!! Always enlightening Jason!